Like many a good and auspicious plan Kent Brewery was founded after a ‘bloke I met down the pub’ conversation. Paul Herbert and Toby Simmonds got chatting about how Paul wanted to start a brewery and they decided to join forces. They produced their first beers in October – so Kent Brewery will soon be celebrating its 5th Birthday. Toby Simmonds of Kent Brewery looking a little serious. There’s a few names in the British brewing scene that automatically make those in the beery know nod appreciatively – one of them being Dark Star (from over the border in Sussex) – Toby began his brewing career as a trainee there. Before becoming a brewer he’d gone to agricultural college but when farming didn’t work out as a career he made the move into the sciences working for Cancer Research UK. “I’ve never looked back since becoming a brewer,” says Toby. “One of the things I’m most passionate about is new hop varieties that can compete with the more vibrant and aromatic varieties produced in North America, Australia and New Zealand. They practice what they preach when it comes to big flavours to compete with imported hops. 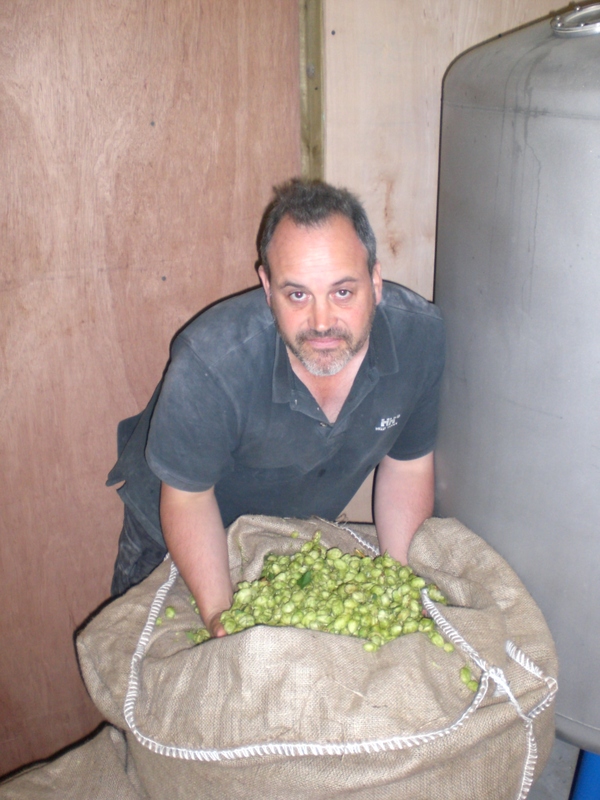 Sixty kilos of East Kent Goldings are packed into their Green Giant IPA (6%) and the beer has quite a following – with pubs placing orders for it weeks in advance. Green Giant will be available at the Green Hop Beer tent at Canterbury Food & Drink Festival this weekend (Fri 25th – Sun 27th Sept) at pubs throughout Kent and select pubs in London. COMING SOON: The Kent Green Hop Beer List 2015 will be published this Tuesday 22nd September at around 12 noon!